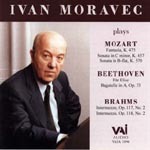 Stereophile proclaimed Ivan Moravec Plays Beethoven, Vol. 2 (VAIA 1069) "one of the most natural sounding recordings of a piano I've ever heard. . . The sheer power and terrible beauty of Moravec's readings . . . make this disc irresistible."